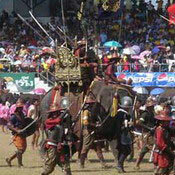 The elephant has long been a central part of Thai culture and has always held a respected place in Thai history. 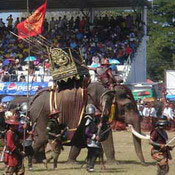 Indeed, in the early years of the Chakri Dynasty, the elephant was featured on the Thai flag. A symbol of power and grace, it is a prominent figure in Thai legend, art and architecture. 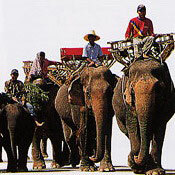 The everyday life of the elephant and its mahout is the central theme of the world-famous Surin Elephant Round-up held each year on the third Saturday of November, to promote a better understanding of the physiology and versatility of Thai elephants. 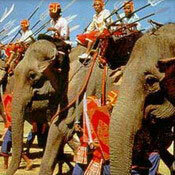 It has been organised by the Tourism Authority of Thailand since 1960. 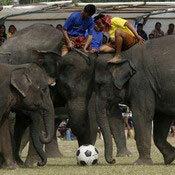 The stars of the show perform a range of tasks which are well beyond the ability of many smaller domesticated animals. Between folk dances and other cultural performances, these versatile behemoths star in displays of old-time elephant hunts, demonstrations of intelligence, strength and gentility, and the spectacular re-enactment of a war elephant parade. The festival takes place over two days. There are elephant races, sparkling demonstrations of old-styles elephant hunts as well as numerous displays of the sheer strength and incredible versatility of the elephant. Battle cries resound around the dusty arena as the festival recreates battle scenes of yesteryear.